I’ve already seen a lot of tweets and facebook statuses about how people can’t wait until March when the gym isn’t so crowded. This makes me sad. What causes us to give up on our goals so quickly? Who told us that if we try and fail we are to not try again until next January? I believe EVERYONE’S New Years Resolution should be to develop perseverance! No matter what your goal or season of life, perseverance is crucial to success. Perseverance will get you back to the gym after a stressful two-week break caused by craziness at work. Perseverance reminds you it’s OK you fell off the healthy eating horse and to get back on and keep going! Perseverance will not beat you up if (when?) you fail at a goal or task, but encourage you to try again. We owe it to ourselves and our loved ones to develop this quality! Those without perseverance leave the gym in March, only to return again in January. Same struggles, same results, same guilt and shame. Perseverance means “continued effort to do or achieve something despite difficulties, failure, or opposition.” Wow. Isn’t that nice? Take a breath and relax. If you fail, it’s OK. You just keep trying. If you face opposition, you keep on pressing. When you face difficulties, you don’t quit. I think of the phrase “slow and steady wins the race” when I think of achieving my goals. My husband and I fall off the exercise bandwagon regularly, whether it’s because of traveling, out of town guests, crazy deadlines at work, or sickness. No matter the reason, we make every effort to get back on ASAP! It’s discouraging to gain back a few pounds we lost or lose some definition we worked hard for, but continuing to press on despite failure keeps us closer to our health and fitness goals, and far, far away from shame, guilt, or feeling like a failure. How great it that? I encourage you to set wise goals, SMART goals (check out this link! ), and be determined to see them achieved. I encourage you to write out the definition of perseverance next to your written goals, so that if/when you face unexpected challenges, you are encouraged to press on! Believe in yourself. I’m expecting an awesome year for you! For more on goal setting with The Fit Tutor, click here! I would be honored to help you achieve your health and fitness goals. 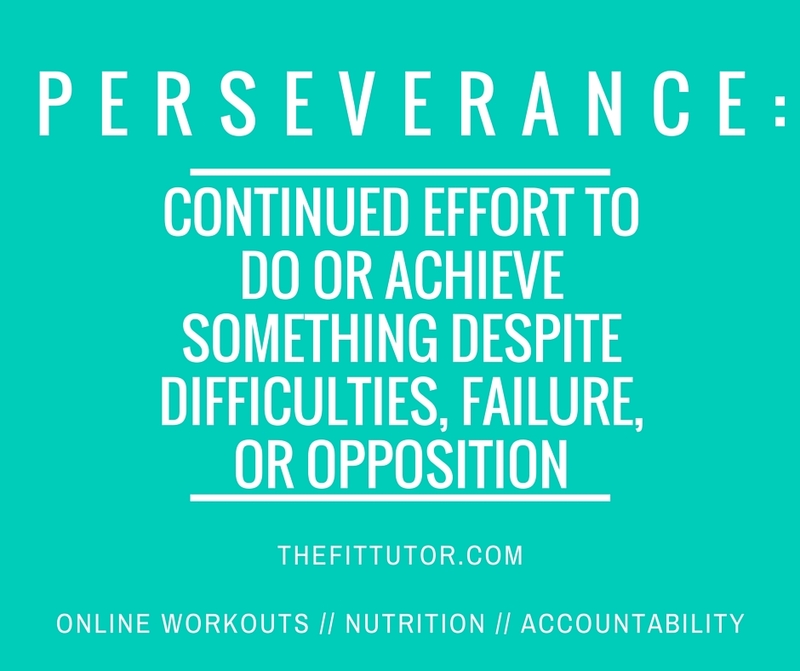 The Fit Tutor specializes in online workouts, a nutrition course to help you finally end that cycle of dieting, and accountability when you feel lacking in the perseverance we just mentioned! Sign up for a FREE 2 week trial, no committment required!